On Jan. 23, Los Angeles teachers returned to the classroom after striking for almost a week with demands for the district to raise salaries and invest more in the holistic well-being of students. 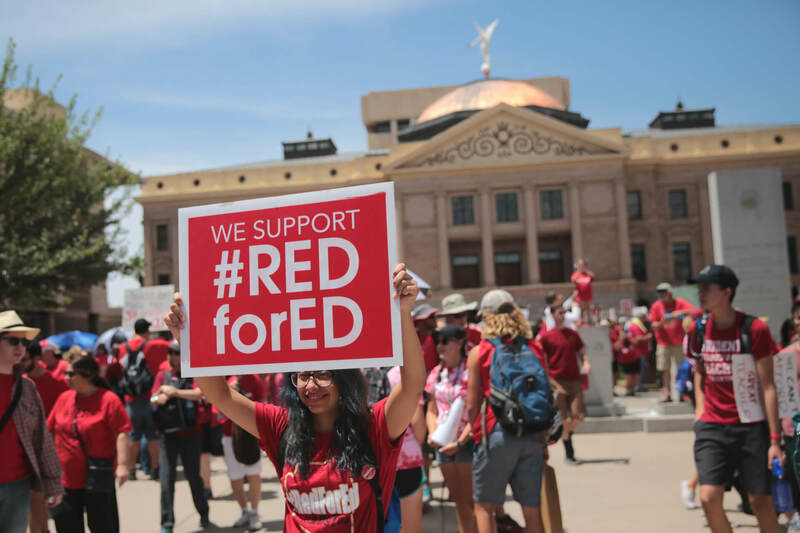 This follows a series of successful teacher strikes last year in West Virginia, Oklahoma, Kentucky, and right here in Arizona. Every year, state leaders find resource to fund prisons and charter schools, while our public education system suffers. After years of cuts, Arizona’s per-pupil funding is one of the lowest in the country. In the Balsz Elementary School District alone, our per-pupil allocation averages out to a mere $5,500 – only half of the $11,000-per-student national average. In Balsz, and throughout Arizona, K-12 education is severely underfunded while the needs of our schools, and our students, continue to increase. The people who are continuously ignored by the legislature are the one that will one day be called upon to lead our civic institutions, drive innovations in our private sector, protect our natural resources, and serve as the guiding light for our collective moral compass. They will be called upon to do these things, whether they are properly prepared to undertake them or not. It is our collective moral responsibility to see that, indeed, our next generation is prepared to face these challenges, and new and unknown barriers, of which we may not yet even be able to conceive. We’re depending upon them to make future decisions that will either help our cities thrive or aid in their decline. Public schools are not an abstract idea, they’re real, tangible institutions. The physical plant of an average public elementary school is the size of a residential block. Naturally, there is wear and tear on buildings over the years, resulting in costly maintenance and repairs. Roofing repairs alone can rise to $200,000. These types of costs keep the working and learning environments safe for faculty, staff, and students. There are also extensive off-campus needs for the students and families that are served. Most schools provide bus transportation to ensure that students have reliable transportation to and from school. Because of budget constraints, some buses don’t have air conditioning, which can make for a brutal environment for students during the warm months. The needs of our students outside of the classroom cannot be ignored. Arizona’s students, on average, suffer from two or more Adverse Childhood Experiences (ACEs) like family issues, abuse, sexual assault, homelessness and hunger. Our students of color suffer disproportionately from ACEs by having a whopping six or more on average. Special needs and disabled students are not far behind. Because of the variety of experiences that students bring in to the classrooms, teachers and staff must be properly trained on how to handle these challenges. Unfortunately, they’re not. In the absence of funding, local districts are restricted in the number of new hires, leading to overcrowded classes with shortages in badly needed support roles like student counselors. Under the direction of their governing board, districts can provide professional development and training to all teachers and support staff to help them learn to identify and manage students suffering from specific ACEs. But this, too, costs money. As a result, rather than seeking to aid students in coping with the adverse events that shape them, or equipping them with the tools to overcome these challenges, our overworked teachers and staff are forced to take the easy way out, turning to punitive responses like detentions, suspensions, and expulsions. Students of color who are more likely to suffer from ACEs are disproportionately affected with high rates of penal actions – actions that have been shown to negatively affect their long-term academic performance and personal development. Now more than ever, we need engaged school board members that know their neighborhoods, understand public education needs, challenge the status quo, and address issues of student performance with equity as the guiding principle for their solutions. But this is just one part of the puzzle. Without the financial resources to act, our school boards are partially paralyzed. They know that there are problems, but do not have the resources to address them. This takes us right back to our state lawmakers and the dollars that they control. These lawmakers are elected by the parents in our communities. We need your voices and experiences to be heard, in the hearing rooms of the state capitol via the “Request to Speak System,” and, most importantly, at the ballot box. We need you to make calls to legislators, write letters, send emails, and participate in rallies. We need you to be present in every way. We need you to speak up, especially when it’s uncomfortable. We need all hands on deck. And we need it at this very moment. Our children are depending on it. Channel Powe is the governing board president for the Balsz School District, the former Arizona School Boards Association Black Caucus President, a member of LocalProgress, and a member of Generation Progress' #Fight4AFuture. While I am in full agreement with the author’s premise, that Arizona is short changing its schools, indeed the most recent Tax Foundation report shows Arizona third from the bottom in school funding, it seems that Ms. Powe’s data is incorrect. She cites the Balsz Elementary School District “allocation” as $5500 per student per year while the national average is $11,000. This is incorrect, Ms Powe is evidently citing the State allocation of funds to the District and not counting local and federal contribution. In fact the Auditor General’s report on her District for 2017 (the last year data is available) as $10,948 compared with $9,653 State wide and $11,762 nationwide. While we need to fight for more public school funds, we need to fight using accurate data.